I said in my skewering of the Romney campaign’s lack of understanding of Venn Diagrams and how they work that we should be equally harsh against any and all bad math and interpretations thereof during this election season. And, lo and behold, Maddow and Moore give us a great example of the murky area of causation and correlation. b) a similar trend is happening in many states. 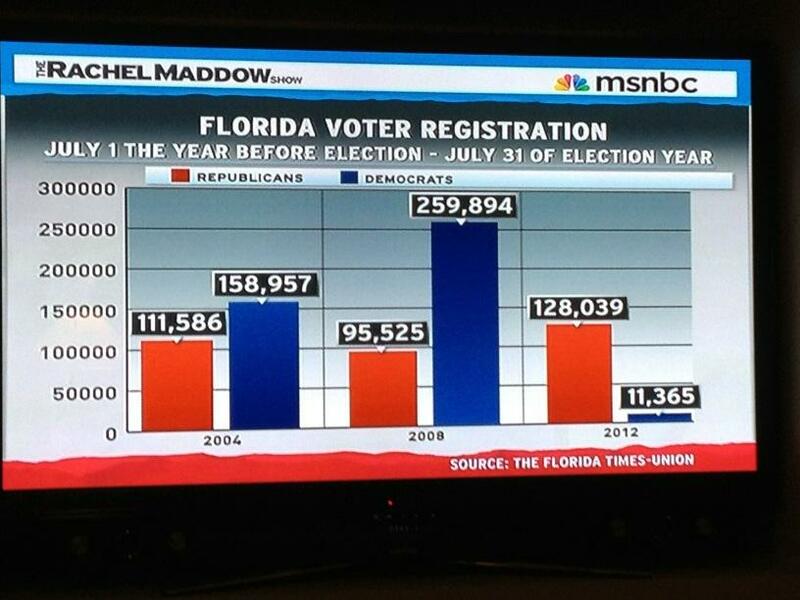 Incumbents don’t get new voters registered. Florida is getting older. Republicans have done a great job at ginning up the base. This is to say nothing of the importance of contested primaries for U.S. president, Senate, House, etc. The data warrants deeper digging. I’m not ready to reject the null hypothesis just yet. We must get rid of Algebra because Roger C. Schank can’t behave at parties, knows weird mathematicians. But at least it was well written and brought up some good points about math instruction, many of which math instructors actually agree with. Hacker had a fresh opinion and voiced it in the Grey Lady, which generated a nice back and forth between educational philosophers and math teachers. Then yesterday, Valerie Strauss decided that Roger C. Shank should throw in a few hundred words in her column space that basically amounted to “ditto, Andrew!” in maybe the most mailed-in piece of writing I’ve seen since that NY Times piece where Tom Friedman rides with a cabbie and learns things. However, being so terrible and so mailed-in, it’s not really worthy of a proper rebuttal. It is definitely worthy of a Fire Joe Morgan style treatment, though. This was written by Roger C. Schank, a cognitive scientist, artificial intelligence theorist, and education reformer. Thank God. For a moment I thought we’d have some math education expertise added to the conversation. And I’m not totally sure any of these things are actual disciplines. Do I have to include the “C” in Roger C. Schank? So many questions. Schank wrote this in response to a recent post I published by University of Virginia cognitive scientist Daniel Willingham entitled, “Yes, algebra is necessary.” Willingham was himself writing in response to a New York Times op-ed, “Is Algebra Necessary?” by Andrew Hacker. Does that make this a response to the response to the response? I’m getting confused. I bet cognitive science can save me from my confusion. Whenever I meet anyone who wants to talk about education, I immediately ask them to tell me the quadratic equation. You are a liar. Either that or the Worst Party Guest in History. I’m picturing that conversation. Party-goer: Hello. My daughter just started fourth grade. Roger: CAN YOU TELL ME THE QUADRATIC EQUATION? Party-goer: /checks to see if there’s a clear path to the exit. I wonder if Roger also quizzes people he just met on other, cherry-picked singular content topics at parties. Roger: WHAT’S OHM’S LAW? WHEN WAS THE BATTLE OF HASTINGS? DIAGRAM THIS SENTENCE FOR ME! Almost no one ever can. (Even the former chairman of the College Board doesn’t know it). Yet, we all seem to believe that everyone must learn algebra. Traffic Lights, because I don’t know the difference between a red-with-a-green-arrow and a green-with-a-green-arrow. Cats, because I can only name, like, three breeds. Magnets, because, well, you know. Why this religious zeal over algebra? It helps students learn how to think, people claim. Really? Are mathematicians the best thinkers you know? I know plenty of them who can’t handle their own lives very well. Meanwhile, every liberal arts major Roger has met all live in houses with three-car garages and summer in the Hamptons. Also, at this point I’d like to remind you that according to Roger’s bio, he’s an expert on artificial intelligence. I’m going to go ahead and throw out that that might not be the most well-assimilated community. Reasoning mathematically is a nice skill but one that is not relevant to most of life. We reason about many things: parenting, marriage, careers, finances, business, politics. Do we learn how to reason about these things by learning algebra? The idea is absurd. LOL if you think finances don’t include math. Or than you can get a job in business without knowing math. Yet, we hear argument after argument about the need for more STEM education (pretending we don’t have lots of unemployed science PhDs). Ha ha. Who’s pretending that? Roger might be the first person ever to lose an argument with a straw man that he created. Oh, and here’s an interview on NPR’s Marketplace where they discuss how business and science PhDs are having a much easier time finding a job than history PhDs. But, as you were saying. Everyone must study chemistry, memorize plant phylla and do lots of trigonometry. Gross! That stuff sounds TERRIBLE. “Do lots of trigonometry”! Ugh. So much trigonometry-doing! The argument for algebra rests on the transfer from math to other areas of life, something that has never been proven despite the claims of people such as University of Virginia cognitive scientist Daniel Willingham. Wait, we’re back on algebra now? I thought we were riffing on trigonometry. And phylla. The defenders of the existing system love mathematics because it is easy to test and there can be test prep courses and state-wide tests and national tests and tests comparing us to other countries, all signifying nothing. My God, I’m starting to think this entire article is a piece of performance art on how to build consistently more ridiculously straw man arguments one after another. Roger is building a Burning Man of straw man arguments, except instead of burning it to the ground at the end, he’ll quiz you on the periodic table to prove that Science is dumb. Who the hell loves mathematics because it yields more tests and test prep and makes the U.S. look like imbeciles? Who loves mathematics for that? (Answer: Roger’s straw man, that’s who). It isn’t just mathematics that is the problem, of course. Why do we all learn to balance chemical equations or memorize homilies about U.S. history? Because back in 1892, the president of Harvard University designed curriculum and said that those subjects should be the basis for high school classes. Any cognitive scientist worth his salt knows that it isn’t subjects like algebra or chemistry that matter. It is cognitive abilities that are important. It is thinking that is important! Finally, we have the answer! We’re not teaching enough Thinking in school. I can’t wait to take Roger’s “Intro to Thinking” course. So much better than my previous course of “Algebra-where-you-don’t-think 101”. If you read the last sentence of Roger’s blog post, he basically refutes this. Maybe. It’s hard to tell. At this point, I’m not sure if he’s writing it or it’s a computer algorithm spitting out attempts at truisms. or trigonometry but you can’t function very well at all if you can’t make an accurate prediction or describe situations, or diagnose a problem, or evaluate a situation, person or object. Oh my God. Please find me the math teacher that doesn’t want to foster those attributes in his or her students, then put me on the panel to help fire them. Because making predictions, describing situations, and problem solving are at the core of what math teachers do. I must admit, these fictional educators Roger creates in his mind DO sound awful. The ability to reason from evidence really matters in life, the names of famous scientists and their accomplishments do not. Dang, and I spent my entire teaching career having students memorize George Boole’s pets’ names. We can teach people the skills they need if we allow them to choose what interests them and then teach them to predict, evaluate, diagnose, etc., within their area of interest. Teaching algebra and then hoping those skills will transfer to other areas of life is simply fantasy, a fantasy that makes our kids bored and miserable in school. The average person never does abstract reasoning. Um, Roger, have you met people? I’m starting to think you may not have ever met a person. It’s probably because you scared them off when you asked them to recite the state capitols right after you were introduced. Because I promise you, every person does abstract reasoning. Whether you’re explaining directions, making an argument, writing songs, drawing a schematic, describing a setting, or pretty much communicating with anyone, you’re abstracting. Talking is abstracting. we could teach courses in that. We do! It’s called algebra! And geometry! We need to begin teaching people to reason well enough to make sensible political and life choices. This is a very important idea in a democracy. OK now I’m convinced Roger is just playing around with his artificial intelligence machine. Because this last line sounds like it was written by a computer algorithm. I figured it out! So it doesn’t pass the Turing test! Either that or it was written by a 6th grader trying to pass his end-of-course Geography essay by following the format that his teacher showed him. It really was this last paragraph (read: two sentences) that was the impetus for this blog post. I mean, it’s one thing to be completely wrong about pretty much everything and to develop entire theses based on cherry-picked and irrelevant anecdotal data (people not being able to answer your Quadratic Equation question). But it’s another thing to just mail it in. I’m willing to bet I put more thought into the first paragraph of this blog post than Roger did for that whole column. I mean, “this [reason well enough to make sensible life choices] is an important idea in democracy”??? At least end it on something other than every middle school paper I ever wrote. So, just to recap, Roger can’t find many people that remember the Quadratic Equation, and he knows some mathematicians who don’t totally have their lives together, something about abstract reasoning, something about democracy, therefore algebra as it exists in Roger’s head should be done away with. This is a terrible job of abstract reasoning. So congrats on proving that point? I’ve mentioned my son a couple times before on this blog. I’m mesmerized by him and his mode of learning and ways of being. He’s like no person, child or adult, that I’ve ever met. He breaks all molds. I started classes this past week, my first baby steps toward a PhD. I sit down in my Statistics class, surrounded mostly by 22- or 23- year olds, open up my backpack to fetch a pen and find these. Most kids make a card or a drawing, but that’s not really Jude’s style. He’s more of a marble and tower kind of guy. But he’s also incredibly affectionate. 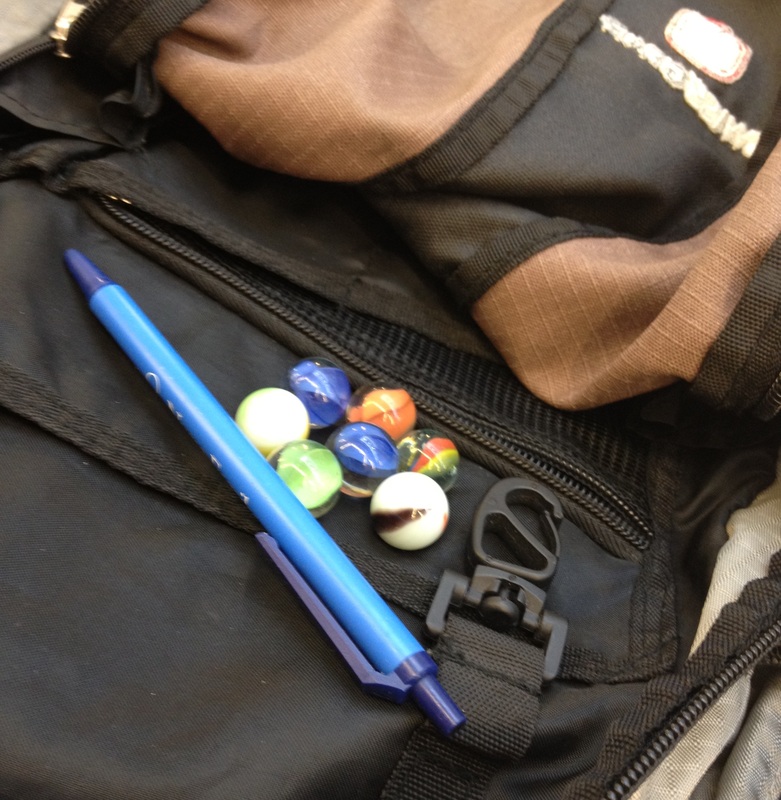 Now, I’m sure he didn’t put these marbles in my backpack to say “have a great first day!” He probably just put them in my backpack because that’s the kind of thing he does when he’s deeply involved in marble tower-building and just likes the feel of marbles in his hands. Still, if you don’t mind I’ll go ahead and take it as a reminder of his presence. Thanks for my good luck marbles, Jude. I’ll probably go ahead and keep them in my backpack for a while. (A lot of people have heroes. Many of those heroes are athletes or celebrities. For others, they are cops, firefighters, and teachers. One of mine is Lee Fleming, a co-worker, friend, and inspiration. Lee has taught Social Studies and Spanish. 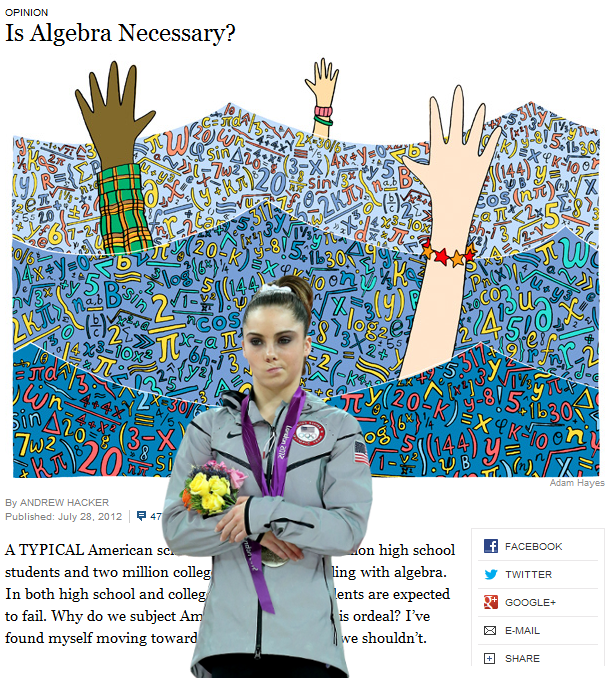 A couple weeks ago, she added “Math” to that impressive resume, despite never being formally taught math ed. 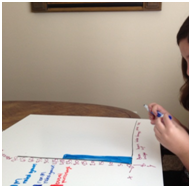 She wanted to get her and her neighborhood kids ready for mathematics for the year and took it upon herself to review some math before the school year started. I am sure you know that the state of Utah will be implementing the Common Core Standards and the kids will be experiencing a new set of standards for the year. No matter what math they had last year or how far along they are, it will be different and [redacted] middle school has re-sequenced the math to align with the core. Some of the skills are the same, but now it includes statistics and some more thinking-based processes instead of only computational-based standards so there will be new stuff not just for the kids but for the teachers too. 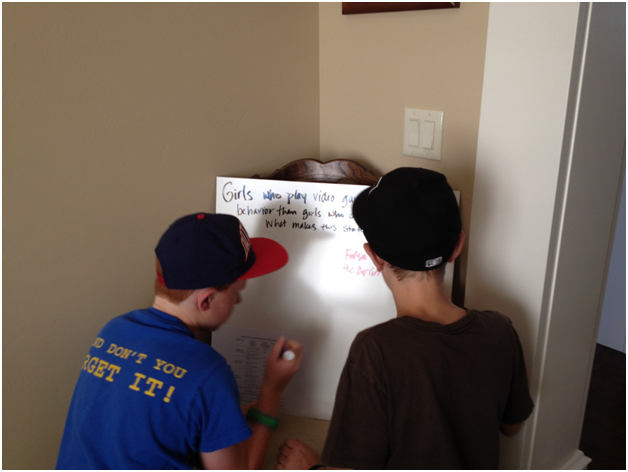 Since I have some pretty solid familiarity with the core from my work over the last couple of years in a national pilot with the math core, I decided it would be good to have my kids prepped a little so they won’t struggle as much with the changes and will be prepared to be more helpful to their peers and the teachers. – I am going to collect a $5 deposit upon entrance that I will *return *to the kids at the end of the session if they either master the math principles of the session or if they can prove they tried. That way you and I both know that they got something out of it and if they don’t care, I get 5 bucks for my time and effort trying to keep them interested. What the heck is this?? Why can’t they just say something like two variables? So I thought if I were a teacher trying to get kids to understand multiple variables and scatter plots, I would like for kids to have some general literacy about what bivariate data looks like and what it means. I also thought that the stats leading up to this standard (I checked out the lower grades too) included binomials, understanding population sampling, and general understanding of stats and graphs. I also thought that it would be important for kids to understand what the data is NOT saying just as much as they should try to learn something from it. What is the relationship between video games and violent behavior? I had the kids pose a hypothesis. 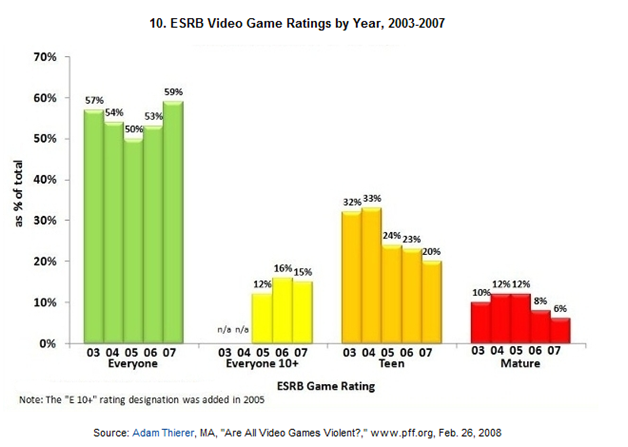 1) Video games have gotten more violent. What makes this statement true or false? 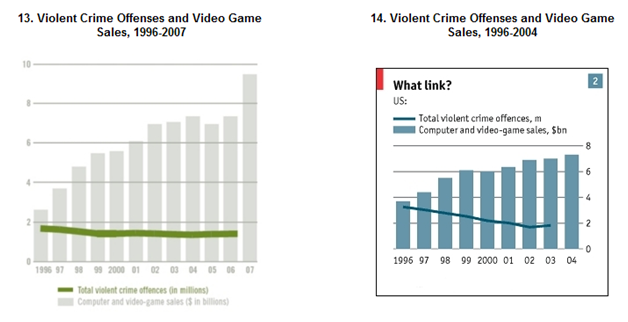 2) Video games have caused an increase in violent crime. What makes this statement true or false? Girls who play video games have worse behavior than girls who do not. What makes this true or false? Boys who play video games are more likely to have behavior problems than boys who do not. What makes this statement true or false? 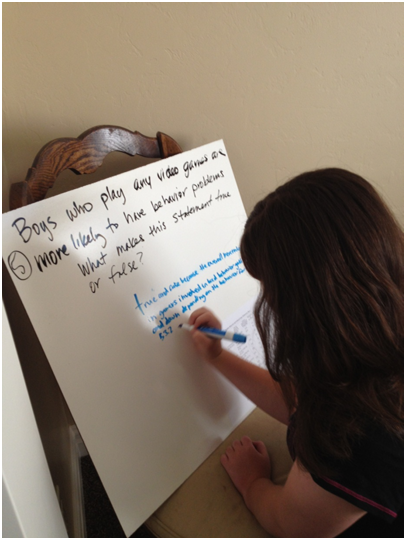 As the use of video games has increased, so has bullying and teenage violence. What makes this statement true or false? I gave each student a color and for each statement they had to write what made the statement true or false. I gave them a choice of pairing up or working alone and I had a mixture of both. 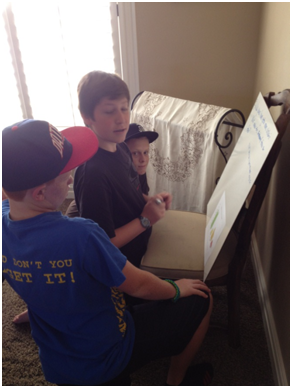 Some kids would write alone and then gravitate to another team. Some wanted to work with a partner the whole time and some kids wanted to be alone the whole time, it seemed to be a good strategy. As I was walking around, I found that the questions they had the hardest time with were the tables about violent behaviors for the gamers. I had semi-anticipated this based on the fact that it was not only complicated but the question asked them about data that was NOT on the chart—the overall incidence rate of behaviors is listed, but it does not disaggregate non-gamers. It was really interesting to hear the dialogue and it was also a great opportunity to demonstrate the value of a good graphical summary of data. Once they came back together, we went through each of the boards and had them clarify any comments, explaining their proof from the data that their statements were accurate. Are video games the ONLY explanation for violence decreasing? Are you sure? Where does it tell you in the data that video games made a difference in violent crime? What if we looked in a place in the world where there was no electricity and we noticed that violence was decreasing too—what would you say the cause would be there? So we collectively talked about independence of variables. Pretty cool, right? I also had them define correlation vs. causation, I don’t honestly know if those are math standards but seemed relevant to the conversation. And even that was only after looking at her work. 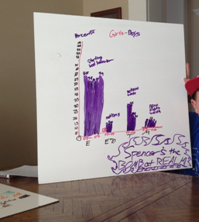 Finally, I had them leave with an exit ticket of explaining the difference between causation and correlation, and then giving them an assignment to look at a minimum of one chart or graph and decide what the graph IS saying vs. what it is NOT. We have part II tomorrow morning, I hope they retained what we discussed last week! I feel like there’s a lot to learn here. What were your takeaways as an educator? Likes? Wonders? Clarifying questions? Next Steps? Let’s hear them in the comments! And thank you, Lee, for providing us a really nice case study. 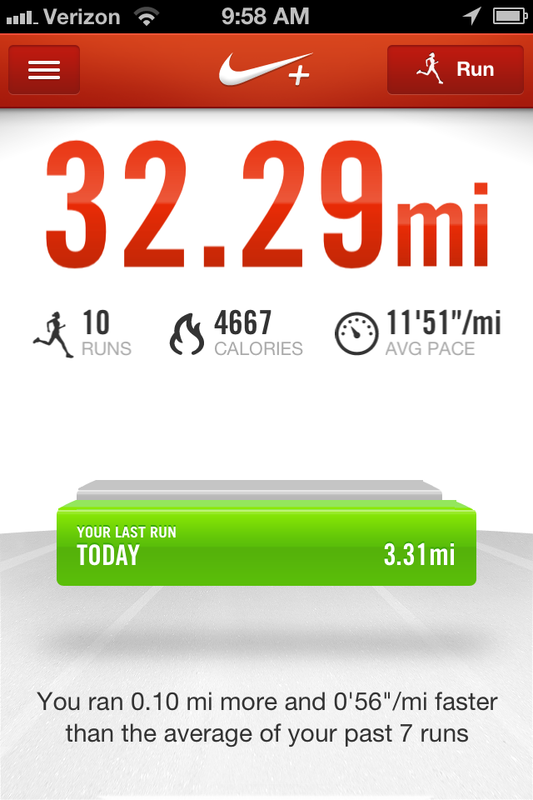 Why doesn’t Nike+ use math to encourage me to run? Now, there are a lot of numbers here, but I’m primarily interested in that last piece. 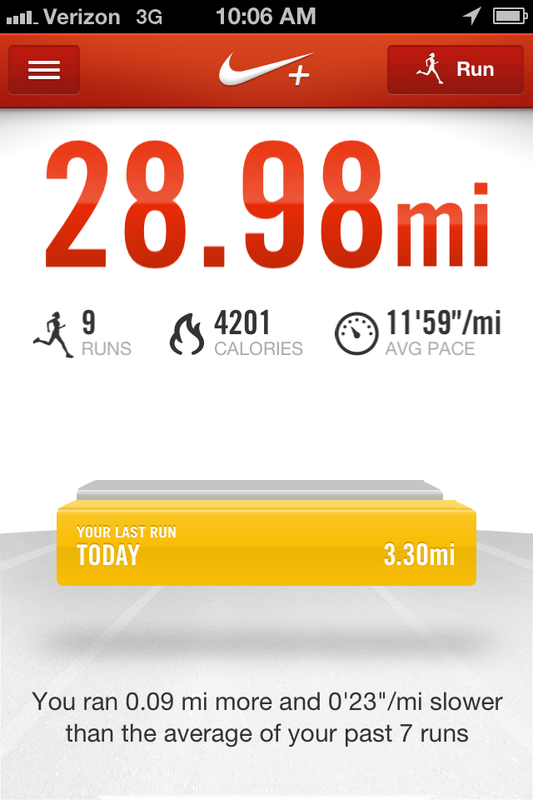 Why did Nike+ choose my past 7 runs? Was there some sort of algorithm to maximize how good I feel about myself? So it looks like it just takes your past 7 runs and compares your mean distance and pace. That’s not very good motivation, now is it Nike+? Can we improve (at least, in my opinion it would be an improvement) Nike+’s distance and pace comparison to help the runner feel better about his or her progress? Would a different measure of central tendency lead to a different, and perhaps more encouraging, data capture? Would averaging a different number of past runs lead to a different, and perhaps more encouraging data capture? 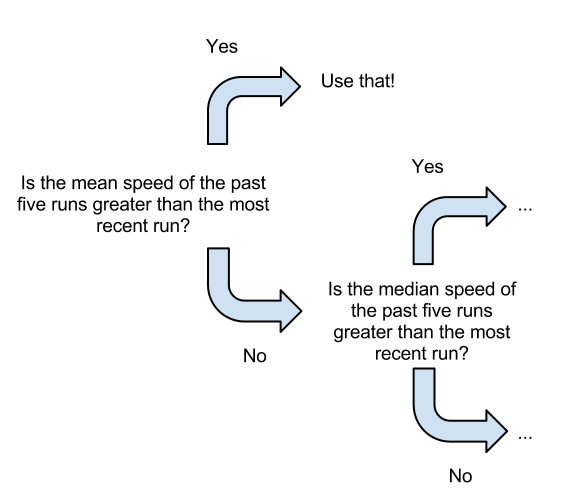 Could we write an IF…THEN or other type of algorithm to encourage the runner? 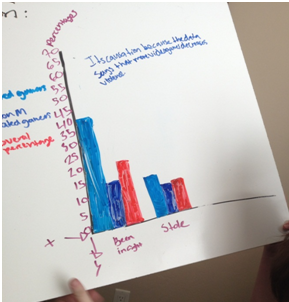 Once students have done that with individual data points, have students sketch out an algorithm or decision tree. 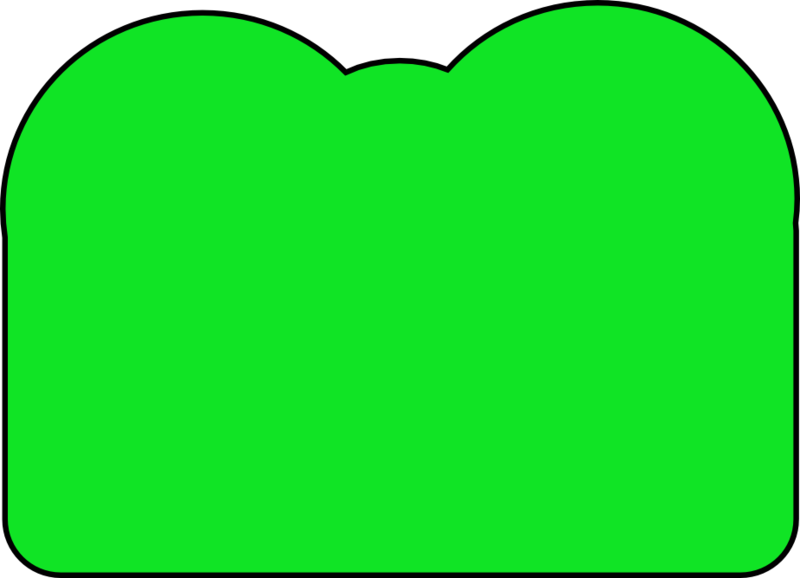 Test that algorithm or decision tree against a new set of runner data. Compare decision trees and algorithms to see who’s is the “positivest”(?). Turn into algebraic expressions if you want, presumably to help out the coders. There are few things more discouraging than seeing that I’m actually running slower than my seven previous runs averaged out. At least package the data so I don’t feel like I’m out of shape.